← Trader Joe’s Complete Salad – Baby Spinach with Cranberries, Candied Pecans, Miner’s Blue Cheese and Raspberry Vinaigrette. Man, do we have similar palates. I loved this stuff to a dangerous degree. I agree that it’s a sticky tangle to mess with, but that forced me to lick my fingers after every bite, and I had few complaints about that. BTW, uncured just means fewer nitrites and nitrates because it didn’t go through the chemical curing process – it’s supposed to be healthier, which I find laughable when one is talking about sugared bacon. 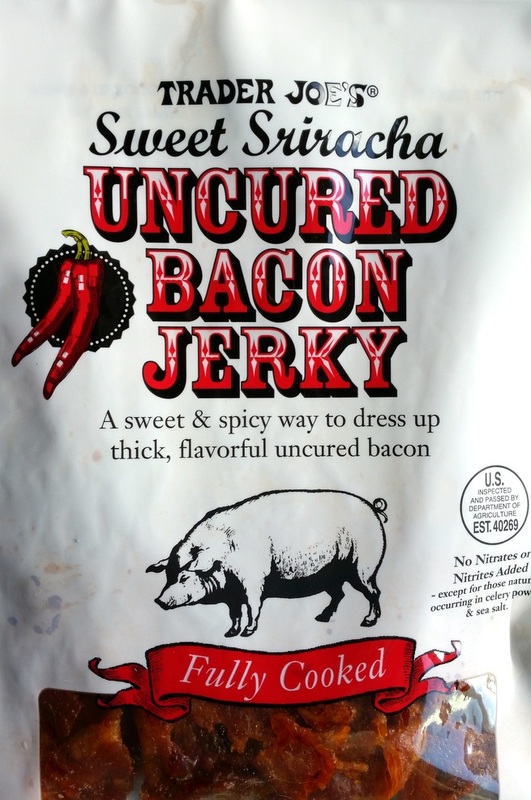 I never truly understood the meaning of addiction until trying this bag of crack bacon. Yes, I get some funny looks when I check out with 10 bags at a time. Yes, my wife scorns me when I replenish my supply when I still have 4 bags at home. I’m just wondering who will take me in to the Sweet Sriracha rehab if these are ever discontinued…. I hope you found a rehab because these were just discontinued 😦 I’m still in shock!